The Nemo Veda 2P is a very spacious hybrid shelter that provides enough livable space not just for yourself and your companion, but also for all your gear. Extremely roomy for a 2-person tent and quite easy to setup: simply stake the four corners, insert the four trekking poles and there you have it...tent is pitched. Best used for 3-season backpacking. 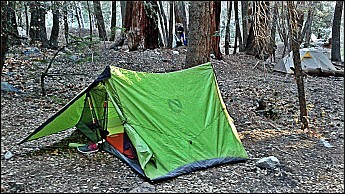 The Nemo Veda 2P was my go-to shelter when backpacking with my daughter. 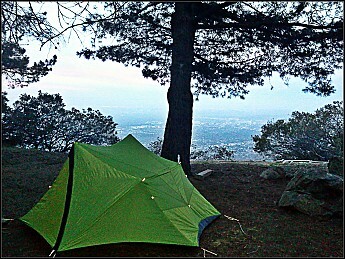 To date, we've used this shelter on four different trips...and hopefully more to come. I was really looking forward to receiving this shelter. From the early descriptions and specifications of this shelter, it was indicated that this shelter weighed only 2 lbs 14 oz. 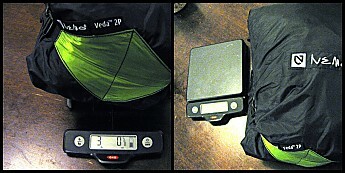 However, when I received it, I was surprised to see that the Nemo Veda 2P weighed a little over 3 lbs. (w/ stuff sack and 6 stakes). 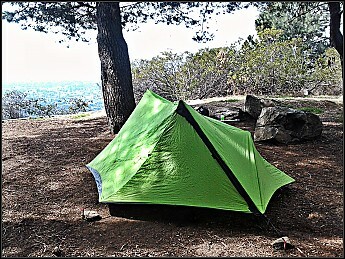 Considering that other lighter fabric options are available, I truly expected this shelter to be lighter than 3 pounds. As an example, the Nemo Obi Elite uses a 10D PU Nylon Ripstop (as opposed to the 20D PU Nylon Ripstop used on the Nemo Veda). 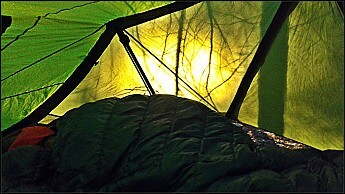 I believe that if Nemo opted to use the lighter 10D fabric, the Nemo Veda 2P would be a lighter shelter. Setup of the Nemo Veda 2P was simple, at least it was for me. Having had experience with trekking pole shelters, I found the setup truly easy and straightforward. As mentioned on my summary, it was really as simple as staking the four corners, adding a pair of trekking poles on each side...then finishing it off with two more poles and two additional stakes. 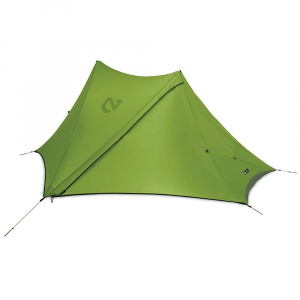 The Nemo Veda 2P shelter offers features you would expect to have on a 2-person tent. Just enough features as to not add so much weight. As a non-free standing tent, it takes some skill to select the best spot to pitch — this is key because once it is pitched, it would be difficult to move once setup. Living in Southern California, we don't see as much rain as other states. Unfortunately, I was not able to test this shelter under rain. Setup on an open area with no natural wind break...and next to a cliff, this was a perfect setup to test how wind-worthy this shelter would be. One one evening we experienced gusts up to 25 miles per hour and the Nemo Veda 2P held up well. With four trekking poles, six staked out points plus two extra tie-outs (not used on this test), the tent barely budged aside from the vestibules flapping from time to time. Obviously, you wouldn't want to set this up where wind would be an issue, but it is good to know that on mild gusts, the Nemo Veda 2P will hold up and keep you safe and sheltered. On one trip, we experienced weather in the 30's with overcast and a slight dew build up. I expected (like other shelters) to have a build of condensation within our tent but to my surprise, there was enough ventilation that the temperature inside the tent was too severe to cause moisture to build up inside. Seeing as Nemo used a heavier weight fabric for this shelter, I have no doubt this would stand for many seasons. With the 20D W/B Ripstop Nylon Shell, 20D PU Nylon Ripstop Vestibule, and 30D PU Nylon Ripstop Floor, the Nemo Veda 2P is made with some of the best and proven materials in the market to date. 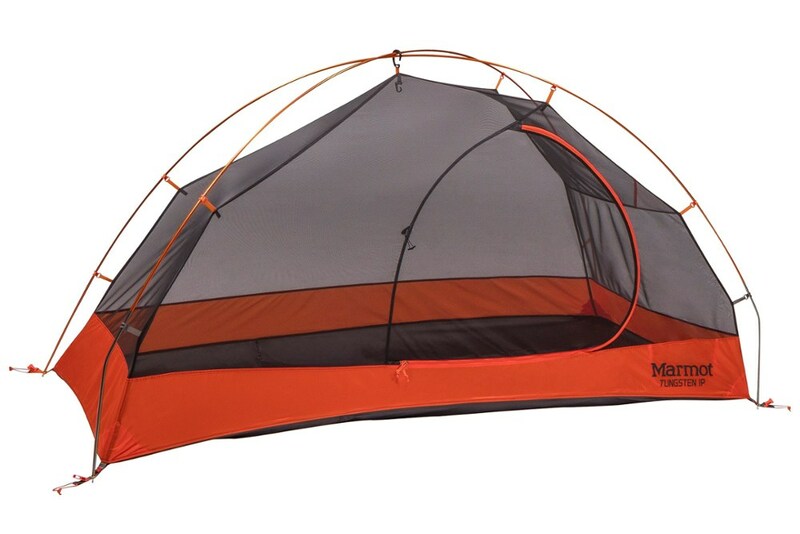 The quality and craftmanship of this tent is truly top-notch. 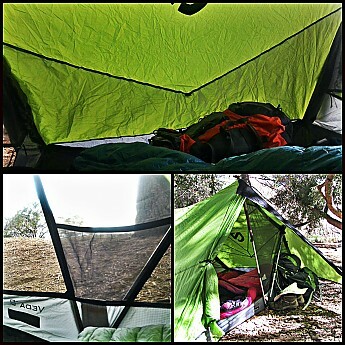 Overall, I was pleased with the performance of the Nemo Veda 2P shelter. It is easy to setup, and the livable space is huge. I did find that the extra amount of space makes it extra difficult to build up warmth inside. However, I did discover that the extra space helped offset condensation. The dual entry doors do make it convenient for occupants to get in and out without bothering each other...especially on those early morning watering sessions. The doors, however, seemed a tad bit narrow compared to the more common D-Shaped door entries commonly found on similar tents. One other feature that I find truly valuable is the fact that this tent pitches all at once — no need hassling over setting up a separate rainfly. This would prove to be valuable when dealing with rain. Weight-wise, I wished that Nemo used their more lighter fabric options like the 10D PU Nylon Ripstop. 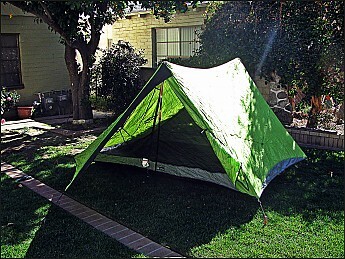 I believe that if lighter fabric was used, this tent would weight a lot less...and still be durable. 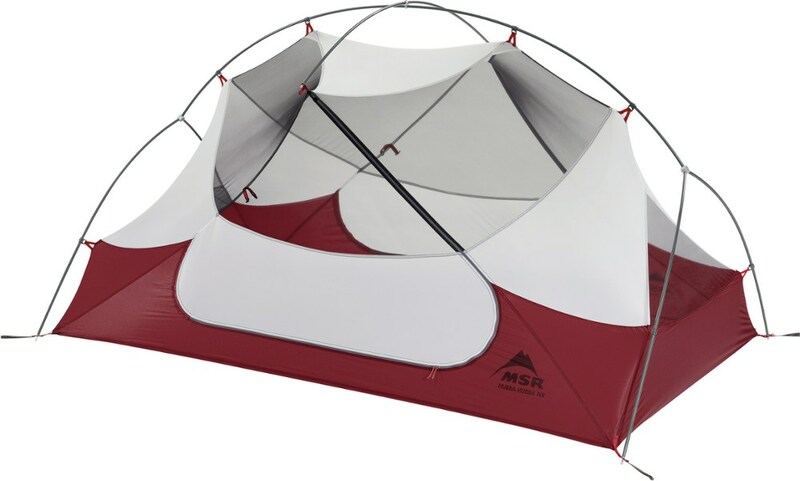 In all, I am impressed of how roomy this shelter is and in a pinch, I have found that you can actually pitch this shelter with just two trekking poles — however, this setup would need to be tested in real-life before it is suggested since it is NOT designed with the use of two poles. I have been backpacking the past three years with trips ranging from simple overnights to multi-day trips in the Sierra Nevada Range, Death Valley, Mojave Desert, Angeles National Forest, Cucamonga Wilderness, Sespe Wilderness, and San Gorgonio Wilderness. To date, I have used the Nemo Veda 2P on four trips in varying conditions minus rain. On non-solo trips, this has been my shelter of choice for my daughter and I. It has served us both very well and I have to say that my daughter loves this shelter because of how large it is. I hope to continue to use this shelter and provide future updates on how well this shelter holds up in time. Angus - does Nemo offer (or suggest) alternatives to trekking poles for users who don't carry them? I'm familiar with shelters that use a single set of trekking poles, but the fact this one relies on TWO pairs (and adjustable ones, at that) would make it a deal-breaker for me. I just purchased a LightHeart Solo Wedge and opted to purchase their aluminum poles in lieu of using trekking poles (which more often than not go unused on nearby hikes for me). Nice review, Angus! 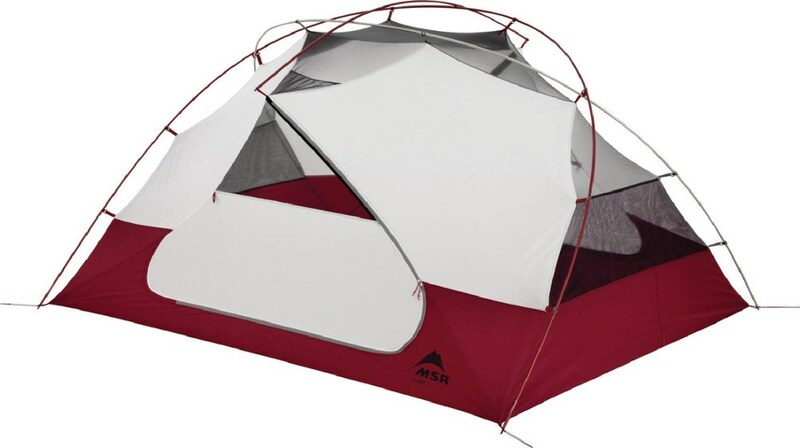 Most backpacking tents are either ultralight and very small or heavy and roomy, so it is nice to see a backpacking tent that is both ultralight and very roomy. Nice review (yet again), Angus. It's great to see you and your daughter enjoying the outdoors together. Thanks, it is definitely a very good tent. Eric, unfortunately, Nemo does not offer optional poles for this tent so having a 2 sets of trekking poles is needed to pitch the tent. However, I did find that a single set of trekking poles may be enough to pitch...just haven't tested this configuration in bad weather to see how well it could work. Cool report. I need to get a gear scale, I like yours. Thanks for your great review Angus! Man, that's one big tent! Thanks for testing it, Angus. 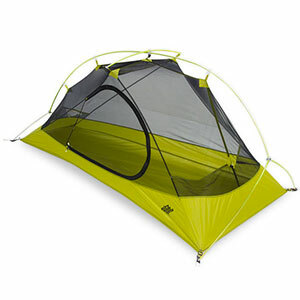 Nice review and nice tent. I wonder why they went with 8ft. for length. That seems fairly long to me. Glad you and your daughter are enjoying it. Nice review! Trekking pole shelters always intrigued me. I used a Dana Designs javalina for solo backpacking for years. But 2 pairs of trekking poles, that's a new one. Since moving to my non-adjustable BD z-poles (which I love), I don't really have the option of using such a design anymore. But still, if you hike religiously with trekking poles, it's nice to make them serve double duty. 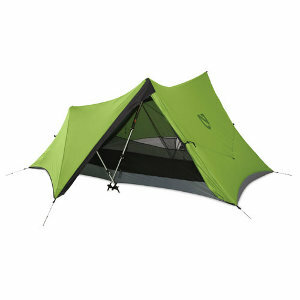 Liked the light weight, and the fact that it had a floor in a trekking pole tent. Found out on night one that the tent was not waterproof, and the tent did not breathe well. I took the Nemo Veda 2p on a 10-day sheep hunt with a partner. We found out night 1 that the seams leaked and even some of the fabric was leaking through. Luckily this would be the only night that we would see rain. 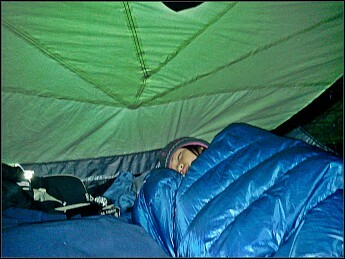 Not the only night we woke up wet, the tent's single wall gathered enough condensation to wet out our bags. The tent did however handle some solid winds, but by day 10 there were visible signs of wear in particular where the main trekking pole met the peak of the tent. The typical weather we had was nice calm cool temps in the morning and afternoon followed by 25-35 MPH winds at night. 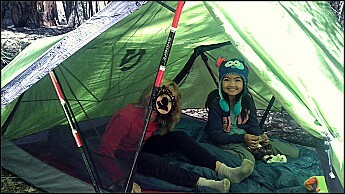 I really liked the design of the tent. There was more than enough room for the two of us inside and with our own vestibules on each side our gear did not get left outside in the elements. Long story short, I liked the design. 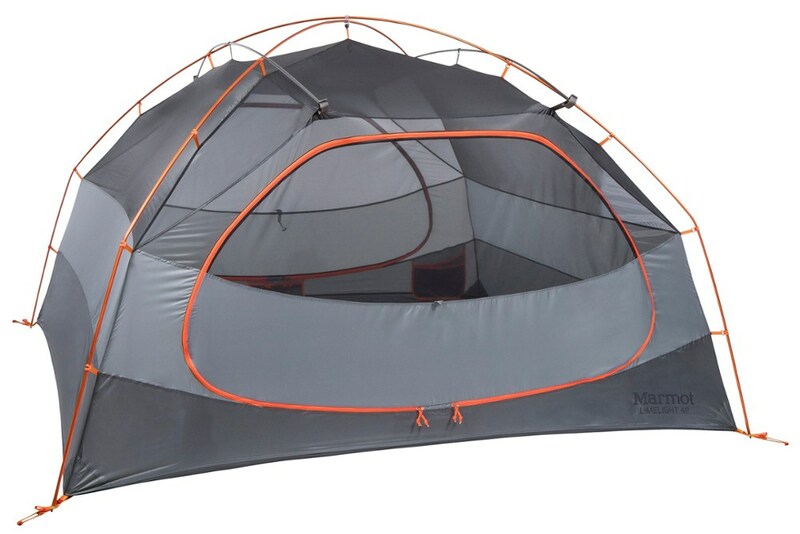 With more ventilation and better materials I think this would be a great 3-season tent. As it is now I would say don't take it out in rain but most every other type of weather. Welcome to Trailspace, John! Thanks for the Nemo review. Were you able to seam seal your tent to help fix the leaks? It would be great to see some pics of your tent setup as well to show what you did and didn't like. I returned the tent upon completion of my hunt. i probably could have seam sealed it where it was leaking on the seams but the porous leaks were irreparable. Thanks for the update, John. Did you find a new tent?